My gardener pal, Uli offered me some of his plants since he is moving and losing his bright windows. I just got them home safely and now must figure out where to put them. They are mostly succulents and cactus along with a lachenalia species native to South Africa. Oh my babies!!! They grow up so fast and before you know it, they're out the door and on their own. Good luck guys! 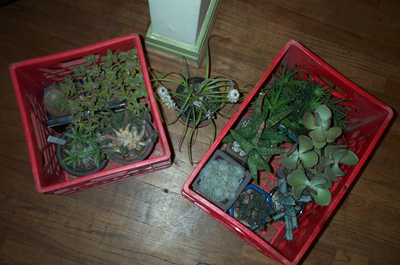 If you find that any of the succulents/cacti don't fit on your window sill I'll take them off your hands.